During World War II, S/Sgt. Albert Lockwood was the tail gunner on the B29 "The City of Trenton". The crew must have really liked Al, since the aircraft was formerly â€œThe City of Bakersfieldâ€, and they renamed it in his honor. The plane was based on Guam in 1945. It went down off Iwo Jima after being delayed by a typhoon on return from a mission over Nagoya, Japan. Sumitomo Metals in Nagoya was the prime target. The crew all got out just fine, with Sgt McNeil breaking a leg after careening off of a tent on the ground . 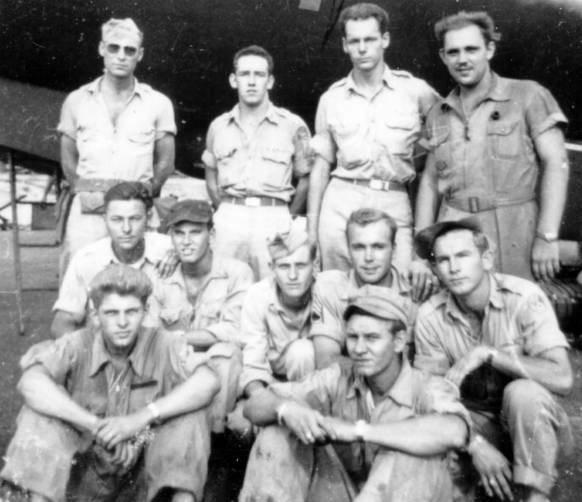 The crew flew 25 missions and were awarded the Distinguished Unit Commendation and 2 air medals each. Aircraft was one of the 20th Air Force's 314th Bomb Wing. The aircrew was: Crew #14Â 1st Lt John L. Randolph, Aircraft Commander, 28th Squadron, 19th Bomb Group, 314th Wing; F/O Billy R. Huffman, Navigator 1st Lt Bernard Van Arkel; Bombardier 2d Lt William E McFain; Radio Officer 1st Lt Joseph E. Jamieson; Flight Engineer F/O Thomas Adams (who recalls the story for Darrell Landauâ€™s collection), R T/Sgt Lloyd B. Ford; CFC T/Sgt Kenneth G. Aiken; Right Gunner S/Sgt Joseph H. Alves; Right Gunner S/Sgt William R McNeill; Right Gunner S/Sgt Harry D. McCluskey; Left Gunner S/Sgt Chester E. Williams; and Tail Gunner S/Sgt Albert L. Lockwood. The crew assembled at Lincoln AAB NB, Oct â€™44. Crew training was at Pyote AAB TX and Clovis AAB, NM during period from Nov to Mar â€™44. The crew was sent to Kearney AAB NB, Mar â€™45, issued new clothing and combat equipment items plus a new B-29 aircraft. The crew flew the new aircraft for 2-3 flights for testing and instrument calibration; then flew to Mather Field, Sacemento, CA, for some new modifications. The crew departed for overseas, made overnight stops at Honolulu and Kwajalean and arrived North Field, Guam, April 10, 1945. Once in Guam, the airplane was reassigned to a more senior crew (rank does have its privileges), and the crew got the old â€œCity of Bakersfieldâ€ to be reworked and renamed the â€œCity of Trentonâ€. Al was awarded the Distinguished Flying Cross for the heroism he displayed in the missions executed during the war. A complete narrative of the mission, compiled by Darrell Landau is posted on our family genealogy website under Histories.